With the most accurate and frequent update schedule, USgeocoder brings you the most precise state legislative by zip code district data you can find for 2019 state legislative district files. Many zip codes cross state legislative district boundaries, making this a hopelessly inaccurate file. Can’t accurately assign districts for PO Box and rural area zip codes. Cobbled together using 3rd party software, have no control of update and accuracy. USgeocoder’s proprietary algorithm combines the Census TIGER files, USPS files, state district boundary files and supplemental parcel data files to produce the most accurate matches for address and postal zip codes to districts. USgeocoder files are built entirely in house and are constantly being tested and improved. We are in regular contact with the USPS and Census TIGER officials regarding accuracy improvements. USgeocoder uses 2016 and subsequent Census TIGER data upon which all political districts are built. Every month, USgeocoder receives the latest US Postal Service data to update the TIGER census files. Typically, a new address is available to USgeocoder within thirty days after the Postal Services' first delivery to it. After the 2010 census recount, states have been going through redistricting for congressional districts and state legislative districts since 2012. Upon states releasing their new boundary files, USgeocoder integrates the new boundary data with its precise GIS data and the latest postal data to produce the state legislative district data. Our State legislative Re-districting files are up to date with the latest court orders and the current legislative assignments. USgeocoder also provides district data with the state legislative elected officials' contact, committee assignment and staff information. This information is updated on a monthly basis. USgeocoder provides the most complete state legislative district data you can find. We cover the 50 states, Puerto Rico and the rest of the island territories. We use THE GOVERNMENT STANDARD for our district names. 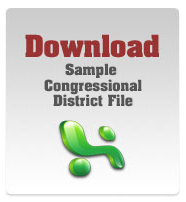 The district names in our files are provided by the states and automatically adopted by the federal government. The naming convention and field lengths are set by census Bureau to accommodate the requirements of each state. The federal governments use them for all federal matters and communications. As one of the very few zip to district data compilers, we are more flexible in customization and pricing. We can produce custom data files per your specifications. USgeocoder State Legislative district data is provided in csv format. It works seamlessly with any database, computer or operating system. Files are updated as often as monthly. They may be purchased by district, state, region, or the whole country. Please contact us for flexible options and pricing details. Get RealTime district and elected official information for your address via USgeocoder API.